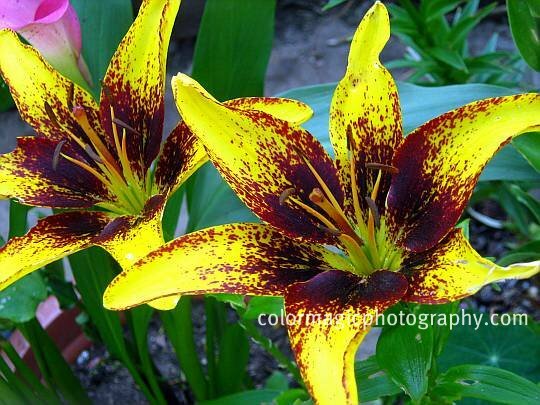 These beautiful yellow lilies with burgundy spots are called the Tango lilies. They are Asiatic lily hybrids, flowering in June-July with larger flowers than other Asiatic lilies. On these lilies, the solid, velvety burgundy color in the flower center breaks down to small dots, spreading out along the edges of the petals. The flowers come in yellow, orange pink, red or white flowers sprinkled with a contrasting color on the throat of the blooms. Its leaves are narrow, lance-shaped, of a glossy green color. These lovely tango lilies in the photo are grown in pots by a friend of mine. See also some gorgeous pink lily macros or some white lilies. What a gorgeous lily, the color combination is stunning. I am seeing so many new lilies and thinking I need to add a new variety or two to my garden.